As companies strive to improve workplace productivity, it is becoming increasingly important that staff are provided with not only the right environment but also the best available tools and technology. Without the right tools, peak productivity just isn’t attainable, no matter how amazing a workplace you create, and so more and more, we are working with clients to ensure that their approach to office design and technology is an integrated one. While productivity is possibly one of the first things you will hear about when discussing technology in relation to the workplace, equally important is providing a work environment that allows staff to work in the most productive way. This is why the office design process begins by identifying the needs of that client and building a brief that highlights their needs and what is required (including technology) to create as productive a space as possible. It is also worth noting that the office design process is extremely complex and simply providing the right technology and space to use it isn’t enough – we need to look at the benefits of embracing new ways of working like agile working or how workplace wellbeing can improve everything from staff happiness, collaboration and importantly productivity. Put simply happy, satisfied workers are better and more efficient at what they do, which creates the perfect loop by facilitating increased productivity. So, let’s take a closer look at the way technology can influence and in some cases, improve office design. We’ve already mentioned agile working and in reality, the success of this new, more flexible way of working is wholly dependent on access to the right tools and technology that empower staff to work where, when, and how they choose. In order to make agile working possible, a flexible office design is also required, providing staff with a choice of spaces to work from depending on the nature of the work i.e. collaborative or concentration. In essence, for agile working to truly work and for companies to realise its full potential, staff require access to a variety of work settings and the right tools and technology. With technology in mind, the first and possibly most obvious consideration is hardware. Imagine a world in which laptops, notebooks, and tablets were not available and all the employees are stuck to their chairs and desks (in other words, the mid-late nineties). While many companies still adopt a 1:1 ratio of staff to desks, where everybody has a dedicated desk and a desktop PC, many others have provided staff with laptops, tablets and smartphones. Obviously, a desktop PC isn’t that mobile and doesn’t facilitate any form of flexible or agile working and consequently, it is no surprise that companies are rolling out the latest technology to staff. The benefits of this increased mobility meaning staff can work from just about anywhere can have a hugely positive impact of not only productivity but also many other factors like staff retention, increased creativity and more collaboration across teams who interact across software platforms. While large companies like Google, Apple and Microsoft foster creative office design and have access to state of the art technology, that other companies might not, they can still act as good examples and inspiration for many – now don’t get me wrong, we are not advocating that everyone should have a Google inspired workplace, just that we can learn from what they do. 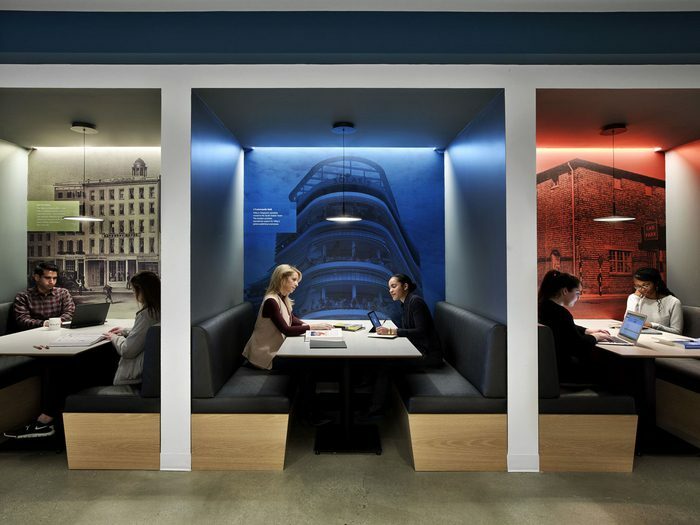 For example, Google have created a space in Dublin that is designed to foster creativity, mixing non-traditional shapes and colors that encourage a work and play environment that would prove impossible if people were hooked to their desks all the time. The emphasis is on allowing staff to work and/or play from any space and empowering them to make that choice. Other offices provide giant beanbags, hammocks or comfy couches which serve as relaxation areas but also as agile work spaces where staff can sit or lie and work away – we don’t have hammocks at K2 Space but we’d sure like to, but this reinforces the point that technology and office design must work in unison to create workplaces that staff love. 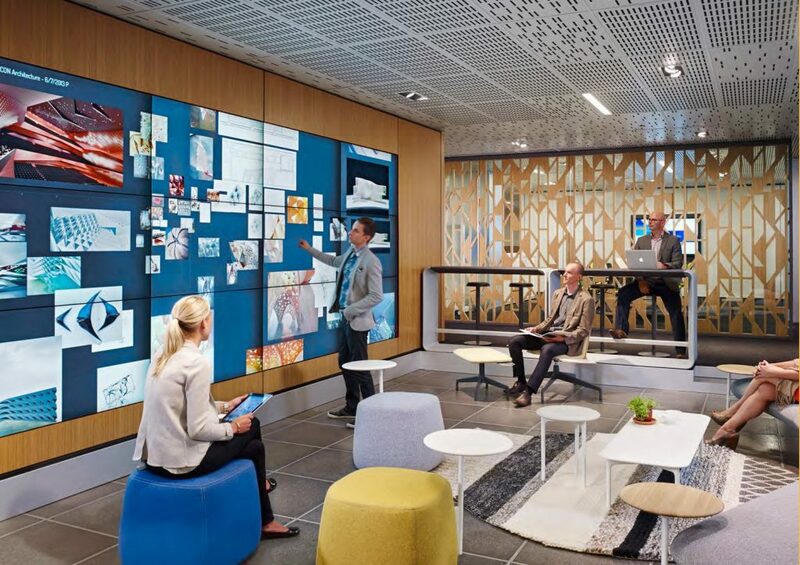 Of course, in today’s app-savvy workplace, there is much more to consider than just hardware when it comes to ensuring technology and office design integrate perfectly. Mobile apps and software have proven to be powerful enablers, can certainly aid productivity and can influence office design. There are numerous examples of apps and software including Slack, Join.me, Skype, WhatsApp and also YArooms that are commonly used and allow staff to interact and be productive from anywhere. For example, YArooms is a meeting room booking software that allows staff to effectively book meetings at any location from an app by proactively managing available rooms and resources. Join.me facilitates easy screen sharing amongst staff members, clients and/or agencies from anywhere with a decent connection (investing in decent headphones is recommended), while workplace and project WhatsApp groups have grown at a massive rate over the past 12-18 months – the point we’re trying to make that technology is facilitating increased productivity, communication and collaboration and office design needs to be aware of this. When people think of the office of the future, the initial worry is that automation (manifested as robots in many cases) will take over their job. However, automation technology has the potential to deliver a leaner, more creative and in many senses, a better workplace, where routine tasks are no longer grinding the mental capacities of the employees, freeing them up to be more creative and productive. It also allows companies and office designers to increasingly focus on creating spaces that encourage social interactions, creativity, and collaboration. Humans are not going to be replaced but rather given more freedom to express themselves (well, that’s what we think and hope). We were offered a glimpse into the future when back in 2017, the Carnegie Mellon University introduced us to Betty, a robot built by Takeo Kanade, a professor of robotics. This autonomous office manager was utilised in office spaces in the UK and Austria and had as main tasks, checking if fire doors were closed, measuring noise levels, counting the number of workers that were working overtime, and checking for clutter build-up in the office. However useful it is to ‘outsource’ these tasks to automated robots, we don’t feel or believe that they will come to replace us. Technology offers an amazing opportunity for companies to not only improve productivity, but also to adapt and reinvent themselves. However, it is equally important that the workplace and office design works and is flexible enough to cater for staff using the latest software. Training and staff engagement are also of paramount importance and ensuring your staff are consulted and are aware of planned changes is so, so important. A good first step is to look at creating an internal multi-disciplinary team to discuss the technology needed/desired and to include employee feedback in discussions. Technology will continue to shape the workplace and if you are moving to a new space or refurbishing an existing office, make sure you include what technology updates you want to include as part of the project – remember, a beautiful new workplace doesn’t work without the beautiful, efficient technology.